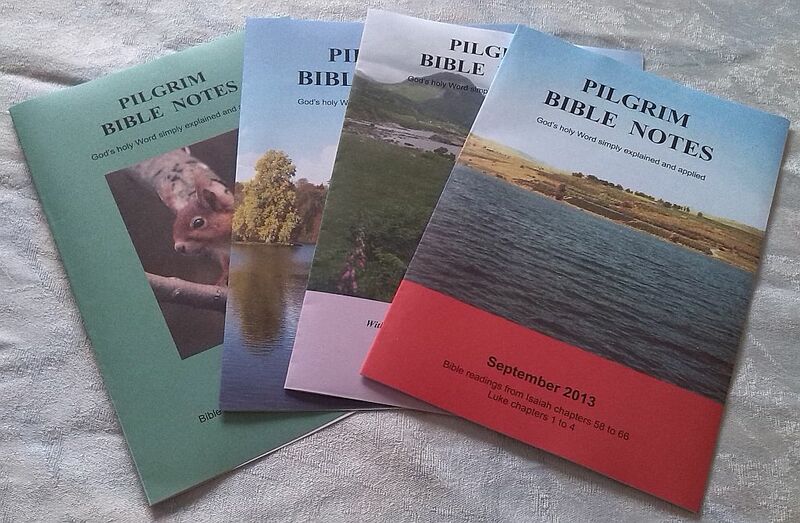 We have now completed over twenty-six years of Pilgrim Bible Notes and have covered the whole of the Bible three times. Previous years’ notes have been presented in a format which allows you to print them as booklets. This continues with files marked ‘print’. I have added a further file, one day per page, which is ideal for reading on computers or tablets. These files are marked ‘tablet’. Thank you so much for these great and sound notes. I found them very helpful in keeping me close to my God and meditating on his words as i pilgrim on this earth. May God continue to use you as an instrument in keeping his children focused on himself to the praise of his name. May you know His strength and encouragement as you do this noble work. God speed. I have been keeping my eye open for any sign of 2018 notes so was extremely happy today to see that the first quarter has now been published. My husband and myself have been reading these notes daily for many years and really appreciate the insight, challenge and encouragement provided for our daily walk with the Lord. God bless you, dear brother, in this work for Him. Thank you very much for these notes. I have been using the Pilgrim Bible Notes for sometime now and they have really been helpful. I’m made to reflect on my christian life on daily basis. May the Lord add more days to your life (s) to continue ministering unto us. Thank you once again Pastor Taylor for today’s exposition of the scriptures. It is indeed a daily battle to walk exactly as to how the Lord would have us walk, even with the Holy Spirit within us. We could all benefit greatly if we were to take the advice that you give us today and our churches would be much more united and blessed. If the devil does get a foothold, he reaps havoc on the Evangelical church. Once again we can only thank Almighty God for these Bible notes, particularly as today we read about the foolishness of King Solomon and how you have warned us of the danger of falling away when we are older like Solomon. How we finish is so very important. Thank you Pastor Taylor for the quality of study in these notes. Really enjoy, and are blessed by these notes, which we have been using for I`m sure 15 years or more, there are many bible notes available today, but none that I know, that have such deep spiritual teaching. I have been using the Pilgrim Bible Notes probably since 2003 or 2004. These notes have enriched my soul immensely. I am yet to find notes better than these! The notes are Biblical and Doctrinally correct. Whenever, I ran out of printed notes, I would feel like a limb had been chopped off my body! Thank God, now I can save them on my tablet! Alec, you are doing a great job for the LORD. He will reward you! I began using these notes in 1996 and stuck with them for many years. This evening I found them online and bless God for that. My hungry soul needs feeding. What a joy it is to wake up on the Lord’s Day and decide to search for your Bible Notes online and to find them! I have been missing them terribly and have not been able to find anything else that systematically goes through the scriptures in a daily bite-sized form. My daily Bible reading has sadly suffered. I am really looking forward to getting on track again now. I find your notes so insightful and encouraging and they help me to better understand God’s Word. I have posted these to my Facebook friends and hope that many more will spread the word. Thank you very much for those wonderful notes may God bless you just know that laboring for God is not in vain. You are preaching to many and God will reward you for that. I love these notes, and so does my wife. They have been such a blessing to us throughout our married life, and for me before that. What better way to start the day than to read the Bible, read Alec’s notes, then pray together. I found the Pilgrim Bible Notes very helpful and edifying. The notes are true to scriptures and recommend it to my Christian friends. We live in Malaysia. Thank you for the Pilgrim Bible Notes. We use it for our daily family worship. We have 80 regular subscribers for the past few years. Thank you for putting the notes on line. I value them highly and have found them very helpful.